Pentagon didn't confirm the reports about a Russian submarine spent a month off the U.S. coast. Yet Russian sources say any submarine locations are classified - but the speculation by itself is enough to play into the hands of opponents to U.S. cuts in defense spending. Although the Pentagon hasn't confirmed that the Russian submarine spent about a month near the U.S. coast, Russia's defense ministry said that Russian submarines can be located in the different areas of the world's oceans, however this information is classified top-secret. "Statements about Russian submarines have appeared in the Western press on regular basis for the last several years," said Russia's Defence Ministry. But the information about the Russian warcraft and other military vessels is kept in secret. A Russian nuclear-powered submarine operated near the U.S. coast for almost a month before being detected. Now a Russian expert speculates that U.S. military officials who oppose cuts in defense spending might have brought the issue to the attention of the media. 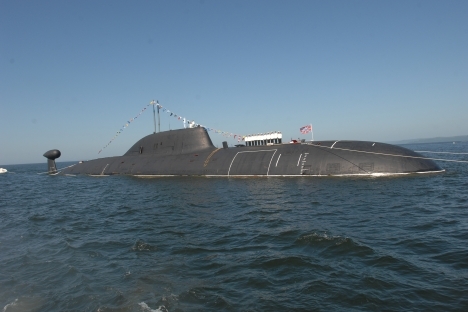 The Russian nuclear-powered multi-purpose Project 971 Shchuka-B submarine (NATO reporting name Akula) operated in the Gulf of Mexico for several weeks in June and July. It is the first such occurrence in the past three years. Akula-class submarines are considered to be some of the stealthiest and hardest to detect by radar, according to ITAR-TASS. Bill Gertz of the Washington Free Beacon, known for his close ties to the Pentagon and special services, broke the news quoting unnamed American officials. The submarine patrol exposed what the officials said were deficiencies in the U.S. anti-submarine warfare capabilities – forces that are facing cuts under the Obama administration’s plan to reduce defense spending by $487 billion over the next 10 years. It cannot, therefore, be ruled out that the information leak involving the Russian submarine might have to do with the discussion of the draft U.S. defense budget in Congress. Igor Korotchenko, Chairman of the Civic Council attached to the Russian Ministry of Defense and Editor-in-Chief of the Natsionalnaya Oborona (National Defense) magazine, said that if the Russian submarine was indeed patrolling near the U.S. coast, it is a normal operating tactic of Russia’s Northern Fleet and its submarine forces. The military expert insisted that American and British submarines are routinely present near Russia’s shores. “Combat duty carried out by nuclear-powered multi-purpose submarines near the coast of a potential enemy is a normal part of scheduled combat operations by the Navy’s submarine forces. What’s not normal is that, in the 1990s, Russia effectively ceased such operations. What has happened shows that our Navy is returning to previous variants of combat duty, which is totally justified and normal,” Korotchenko said. Korotchenko also suggested that a public scandal over the Russian submarine is needed to shake down U.S. President Barack Obama for additional spending on U.S. defense-related programs. “It is well-known that the Russian threat factor is actively used to resolve budget problems. Naturally, for every senator a report of a threat is like a red flag to a bull and, in a fit of patriotic indignation, they will vote to approve additional spending for the programs,” Korotchenko said. This article has been abridged from the original Russian version, which is available in the Vzglyad newspaper.